Aware that the Tippling Bros. would be in charge of the drink offerings, I was revved up to attend last week's Classic & Vintage Artisanal Spirits launch party at the Classic Car Club of Manhattan hosted by Domaine Select Wine Estates. The Classic & Vintage collection is a line of boutique products including: Averna, G'vine, Death's Door, Tuthilltown, Benromach, Ransom Old Tom Gin, Rhum J.M., and The Bitter Truth Bitters, plus many more. This is an unprecedented collection of rare small-batch gems made available to the masses, greatly due to the increasing interest in classic cocktails. This event was one of the better-organized cocktail parties I have seen in a while, and the Tippling Bros' (Tad Carducci and Paul Tanguay) event planning skills really shined, as did the stunning collection of classic cars. 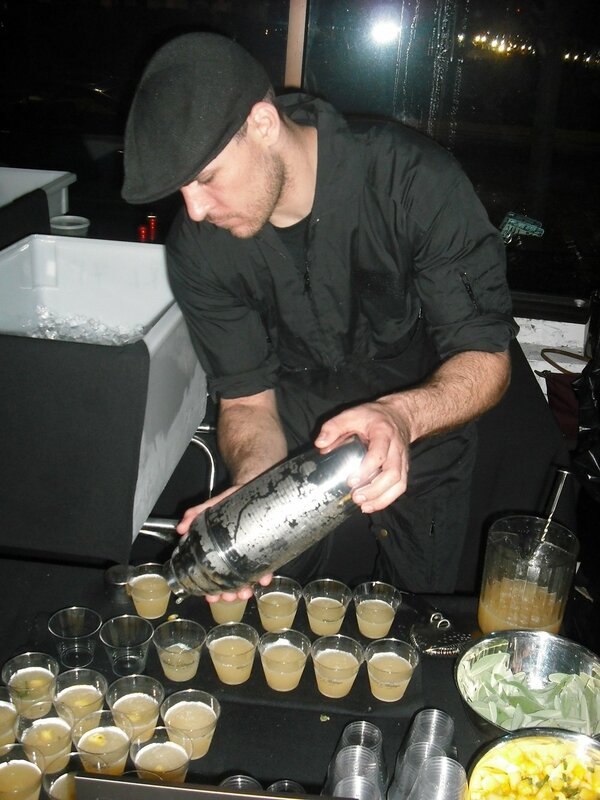 Tad and Paul are brand ambassadors for the Classic & Vintage collection, and they gathered top mixologists to mix drinks for the event: Danny Valdez (New Orleans), Sean Kenyon (Denver), Misty Kalkofen (Boston), Justin Noel (NYC), Jason Littrell (NYC), Tonia Guffey (NYC), Frank Cisneros (NYC), and Gianfranco Verga (NYC). One highlight for me was that I got to try Ransom Old Tom Gin for the first time. Created by Sheridan, Ore. winemaker/distiller Tad Seestedt with the input of cocktail historian David Wondrich, Ransom has yet to launch on the shelves of NYC. The gin manages to marry maltiness and herbaceous sweetness (orange, cardamom, juniper) magnificently. Ransom is based on 18th century distillation and aging methods, and Tad has sought to make the most historically-accurate Old Tom Gin in the world. The base wort uses malted barley to impart a subtle malty sweetness, and the final distillation is run through an alembic pot-still for maximum aromatics. Then the whole batch rests in neutral Pinot Noir barrels for texture and color. The gin has a warm golden tinge to it, and I have to say, I love the apothecary-style bottle design. Sipping it neat was pure pleasure, and I could also imagine it working perfectly in a Martinez.